The second Shinbashi (also Shimbashi) Station sometime in the 1920s. 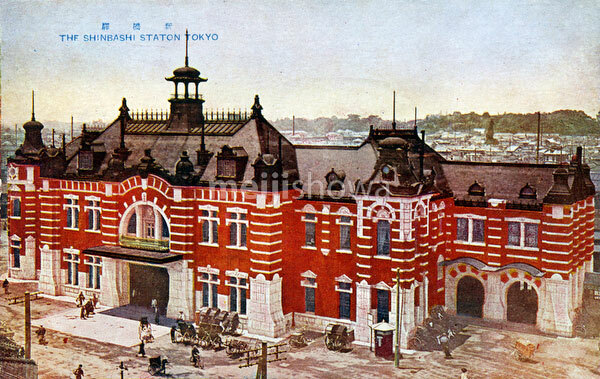 The impressive red brick building was completed west of the original Shinbashi Station in 1914 (Taisho 3). It was used until 1923 (Taisho 12) when it was destroyed by the Great Kanto Earthquake. Architect Kingo Tatsuno (辰野金吾, 1854–1919) re-used many of the characteristics that he had employed for his design of Tokyo Station.